A prisoner in northern Spain woke up in a hospital mortuary after being certified dead by three doctors, Spanish media report. Gonzalo Montoya Jiménez, an inmate at a jail in the Asturias region, regained consciousness just hours before an autopsy was due to be performed. His body is said by his family to have been marked in preparation for the post-mortem examination. He is now under observation in intensive care at an Oviedo hospital. Family members told local newspaper La Voz de Asturias that Montoya "had autopsy markings on him, ready to be opened up". 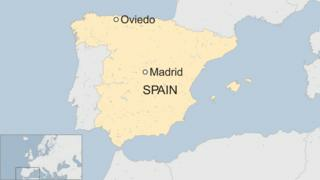 It is suspected to be a case of catalepsy, hospital sources told Spanish news channel Telecinco. Catalepsy is a condition where a person's vital signs slow down to the point of being almost imperceptible. However this has yet to be confirmed. His "death" had been certified by three experienced doctors at the prison, who ordered his body to be sent to the mortuary for further examination.